Lets face it we all love pizza well most of us do. It is even better if its homemade. For us Pizza is not just a meal; its an epic event both P and I participate and we add our flair. There is nothing better than creating the pizza from scratch. It’s so much more fun than ordering, I promise. The pizza dough has its share of bad days, the dough does not rise or it is nothing like a pizza crust and perhaps more akin to a wheat cracker. Or perhaps it is thick as a bread. So after a lot of trial and error; P and I decided to go the thin crust way. Personally, I prefer thin crust , crunchy and light and packed with a lot flavour. This crust has a nice bit of crunch, but it’s pliable enough to fold in half if required. 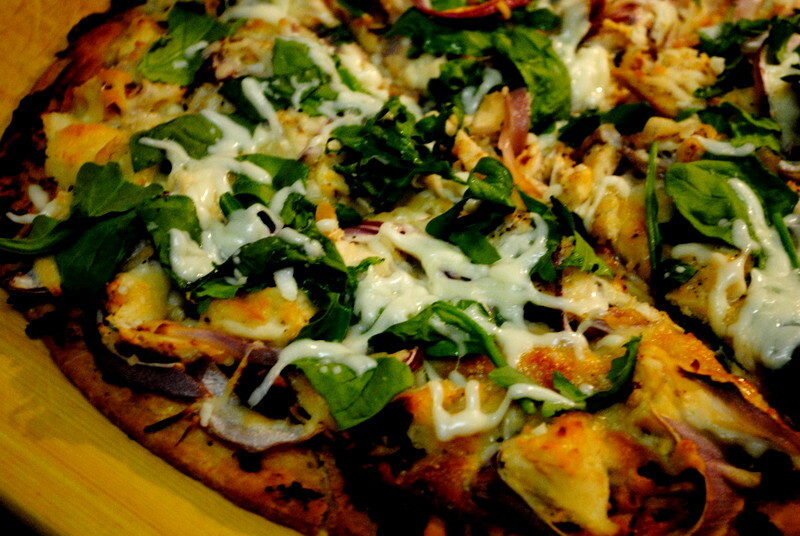 The mild wheat flavor is a nice backdrop to whatever toppings you want to layer on top. Since we’re keeping the crust on the thinner side, this dough doesn’t actually require time to rise. Combine the water and yeast in a mixing bowl, and stir to dissolve the yeast. Add the flour and salt to the bowl and mix until you’ve formed a shaggy dough. Turn the dough out onto a clean work surface along with any loose flour still in the bowl. Knead until all the flour is incorporated, and the dough is smooth and elastic, about 5 minutes. The dough should still feel moist and slightly tacky. If it’s sticking to your hands and counter-top like bubble gum, work in more flour one tablespoon at a time until it is smooth. You roll it out after kneading it briefly and let it rest on the counter while you prepare the toppings. Arugula leaves or spinach Chop up 1 chicken breast into small pieces, about 1 inch thick. Heat up a large skillet over medium high heat. Add 1 tablespoon olive oil. When the oil is hot, toss the chicken into the pan. Cook everything until the chicken is golden brown Preheat your oven to 425 degrees. Next Roll the dough out onto 2 pizza pans or stones. If you would like to use a large cookie sheet that’s fine as well. Brush each base with some olive oil and spread the green pesto sauce. Add about 1 1/2 cups of mozarella cheese to each pizza. 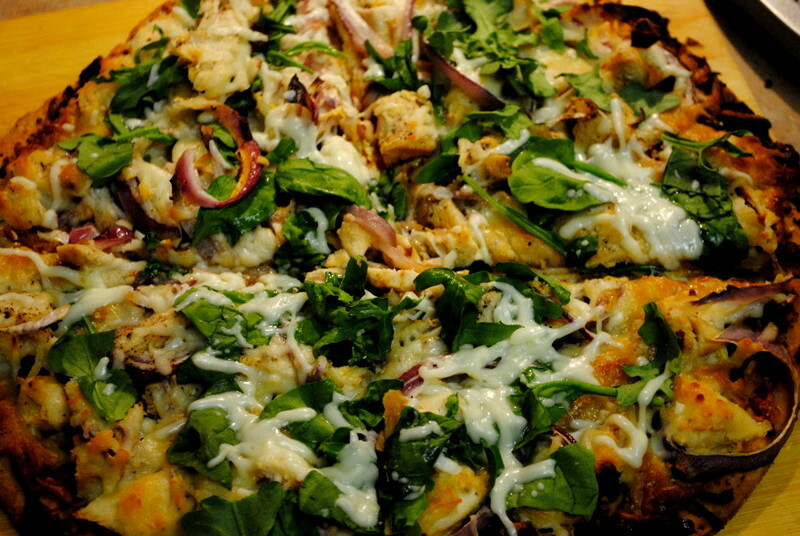 and divide the chicken and the onion slices Chop some arugula leaves or spinach and keep it aside do not add this on the pizza at this point of time. . Pop your pizza into the oven and bake for 10-15 minutes, or until the bottom of the crust is golden brown and the the cheese is melted and bubbly. I usually just cook one at a time. But if you have a really large oven then you can cook two together. 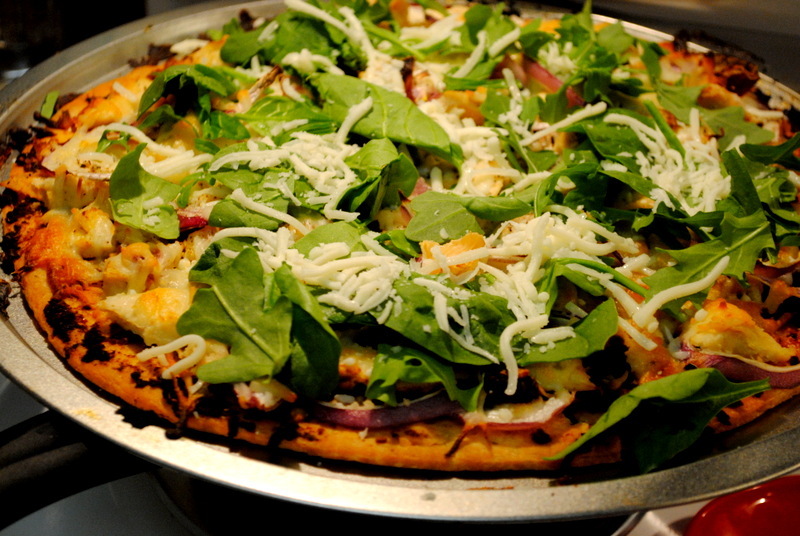 Once the pizza is cooked sprinkle the arugula or spinach leaves with some more cheese and stick it into the oven for about 2 min long enough for the cheese to melt but make sure the leaves do not wilt. Cut and enjoy, we had ours with a glass of Bourbon. Note: ( these tips are from the Kitchn website and it really works) You can make dough ahead by letting the it rise a little or even refrigerating it overnight. This gives the dough even more depth of flavor and a crackling crust. Once you’ve finished kneading, let it rise until doubled, divide it in two, and store the balls of dough in separate containers. When you’re ready to make your pizza, take the dough out of the fridge and let it warm up a bit while you prepare the toppings—ten minutes or so should do it. Previous Post Eggplant Curry and some random facts..